Is it hard to learn to ride? Just like most things, it's a learned skill. On average it takes about 10 hours. Remember, that's an average. One of our riders has regular problems with vertigo but was still able to learn to ride. Patience is a must. Again, like most new learned skills, you may hit a plateau occasionally. How old do you have to be to ride? While we've heard of, and seen riders as young as 3, we ask that you be at least 12, unless approved by the instructors. Many younger riders learn very quickly. We just ask that their parents stay with them while learning and riding. Many of our riders are under 12, so just ask. On the other end of the spectrum, there is no age limit. We know of a rider in his 80's and we have many adult learners. The Kracks both learned in their mid thirties and we have had learners in their 40's and 50's. Do I need to own a unicycle to ride? No! We want to make it easy for you. We have many "loaner" uni's available for use during ride time at the Y. If we should run low on loaners, we give priority to the newer riders. Do I need to have a helmet? Yes and No. You must wear a helmet to ride. If you don't have one or forget yours, we do have loaners. What if I have my own unicycle? Bring it! It must have plastic pedals and a non-marking tire. What wheel size should I start with? A 20" or a 24" uni. One thing to keep in mind: you get what you pay for. Avoid Ebay and Amazon.com. The uni should cost in the neighborhood of $100 for a basic beginner model. One with a nicer seat is around $125. I can ride. Where can I try a different size unicycle? We've got pretty much every size wheel available for a test ride. 19" (Trials), 20", 24", 26", 29", and even a 36". If you want to try one out email us first at butlerwobble(at)gmail(dot)com. We need advance notice to make sure we bring it with us. Are we joining the circus? Nope. 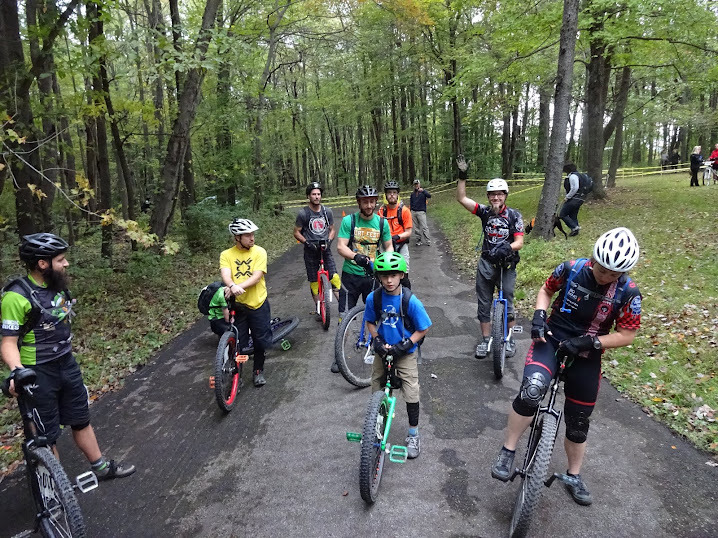 We just love to ride unicycles! Just like other sports, unicycling has many different disciplines. These include Distance, Mountain Unicycling (MUni), Track/Racing, Freestyle, Flatland, Trials, and Street.